A tick bite does not cause pain or itch. So, ticks may not be noticed for a few days. After feeding on blood, ticks get swollen and easier to see. Ticks fall off on their own after sucking blood for 3 to 6 days. After the tick comes off, a little red bump may be seen. The red bump or spot is the body's response to the tick's saliva (spit). While it's sucking blood, some of its spit gets mixed in. The wood tick (dog tick) is the size of an apple seed. After feeding, it can double or triple in size. Sometimes, it can pass on Rocky Mountain spotted fever or Colorado tick fever. The deer tick is the size of a poppy seed. After a feeding, it can triple in size. Sometimes, it can pass on Lyme disease. Over 95% of people who get Lyme disease live in or have traveled to 14 high-risk states. Lyme disease mainly occurs in the Northeast, Mid-Atlantic and upper Midwest. Many states do not have Lyme disease. The CDC reports over 30,000 new cases per year (2015). 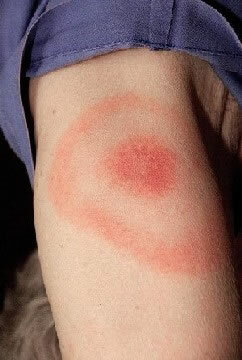 About 80% of Lyme disease starts with a bull's eye rash called erythema migrans. The rash starts at the site of the tick bite. It starts on the average at 7 days. It grows larger quickly, to more than 2 inches (5 cm) wide. It can become as large as 12 inches (30 cm). It lasts 2 or 3 weeks. Treatment of this rash with an antibiotic is advised. This almost always prevents the later stages of Lyme Disease. If Lyme Disease isn't treated, heart, joint and neurologic problems can occur. Giving antibiotics after deer tick bites to prevent Lyme Disease depends on the risk. The risk is low with brief attachment. The risk is high if the deer tick was attached for longer than 36 hours. It's also higher if the tick is swollen, not flat. Ask your doctor for advice. The risk of Lyme Disease after a deer tick bite is low. Even in high risk areas, only 2% of deer tick bites cause Lyme Disease. New redness starts more than 24 hours after the bite. Note: bacterial infection is rare. It does not start until at least 24-48 hours after the bite. Red-ring or bull's eye rash occurs around a deer tick bite. Note: the rash of Lyme disease starts 3 to 30 days after the bite. Most wood tick bites are harmless. The spread of disease by wood ticks is not common. If the tick is still attached to the skin, it needs to be taken off. Try one of the methods described below to take out the tick. Use tweezers. Grasp the tick as close to the skin as possible (on its head). Hold the tweezers sideways next to the top of the skin. Pull the wood tick straight upward without twisting or crushing it. Keep a steady pressure until the tick lets go of its grip. If you don't have tweezers, you can use your fingers. Other options. You can use a loop of thread around the jaws. You can also use a needle pushed between the jaws for traction. Jaws are the part of the head attached to the skin. Not helpful: Covering the tick with petroleum jelly or nail polish doesn't work. Neither does rubbing alcohol or a soapy cotton ball. Touching the tick with a hot or cold object also doesn't work. Most deer tick bites are harmless. The spread of disease by deer ticks is not common. Even in high risk areas, only 2% of deer tick bites cause Lyme disease. Most people who get Lyme disease live in or have traveled to 14 high-risk states. Lyme disease mainly occurs in the Northeast and upper Midwest. Many states do not have Lyme disease. If it is swollen, try to remove with a tweezers. See wood tick advice. Tiny deer ticks need to be scraped off. You can remove them with the edge of a credit card. If the wood tick's head (mouth parts) breaks off in the skin, remove any large pieces. Clean the skin with rubbing alcohol. Use a clean tweezers or needle to scrape it off. If a small piece remains, the skin will slowly heal and shed it. After the tick is removed, wash the wound with soap and water. Also, wash your hands after you are done. This helps to prevent catching any infections carried by the tick. Use an antibiotic ointment (such as Polysporin). No prescription is needed. Put it on the bite once. Most often, tick bites don't itch or hurt. That's why they may not be noticed. The little bump goes away in 2 days. If the tick transferred a disease, a rash will occur. It will appear in the next 4 weeks. After being outdoors in deer tick areas, check for ticks. Remove any that are attached. Also, take a shower soon after coming inside. Tumble any clothing in a hot dryer for 10 minutes. That should kill any ticks left in the clothing. When hiking outside where there are ticks, wear long clothing. Tuck the ends of pants into socks. Use a bug repellent to shoes, socks and exposed skin. Permethrin products (such as Duranon) work well to repel ticks. Unlike DEET, these products are put on clothing instead of skin. They also can last through many washes. Use it on pant cuffs, socks and shoes. You can also put it on other outdoor items (bug netting, sleeping bags). Do not put it on skin. Reason: Sweat changes it so it does not work. DEET also works well to repel ticks. It can be used on the skin not covered by clothing. Use 20-30% DEET for children and teens (AAP). Note: 30% DEET protects for 6 hours. DEET is approved for use in children over 2 months of age (AAP). This is a picture of a brown Wood Tick. The Wood Tick (also called dog tick) can sometimes transmit Rocky Mountain spotted fever and Colorado tick fever. 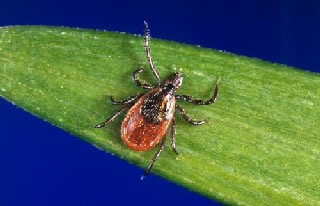 The Deer Tick (also called black-legged tick) is between the size of a poppy seed and an apple seed. 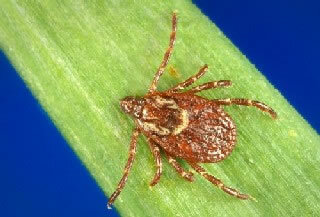 The deer tick is found on a wide rage of hosts including mammals, birds and reptiles. This tick can transmit Lyme disease to humans and animals during feeding; this occurs when the tick insert its mouth parts into the skin of a host and slowly ingests the host's blood. Use a pair of tweezers and grasp the wood tick close to the skin (on its head). See image. Pull the wood tick straight upward without twisting or crushing it. Maintain a steady pressure until it releases its grip. If tweezers aren't available, use fingers, a loop of thread around the jaws, or a needle between the jaws for traction. Needs to be scraped off with a knife blade or credit card edge. Place tick in a sealed container (e.g., glass jar, zip lock plastic bag), in case your doctor wants to see it. Note: Covering the tick with petroleum jelly, nail polish or rubbing alcohol doesn't work. Neither does touching the tick with a hot (like a match) or cold object. The majority of cases of Lyme disease start with a bull's eye rash at the site of the tick bite. The rash can occur days to weeks (typically 7-10 days) after a tick bite. Treatment with antibiotics is indicated if this rash appears. 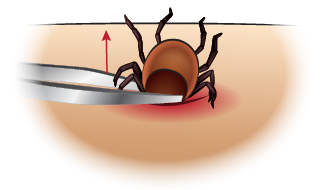 It is thought that Lyme Disease can be prevented if the tick is removed within 24 hours of attachment. 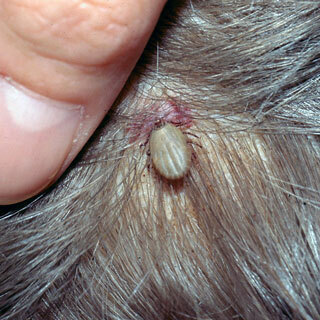 This shows a tick feeding on the scalp.